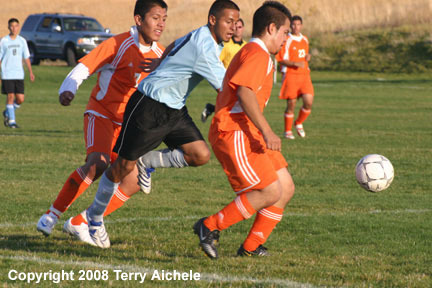 A Umatilla defender makes a move to tackle the ball as a Riverside forward drives into the right side of the Umatilla zone. 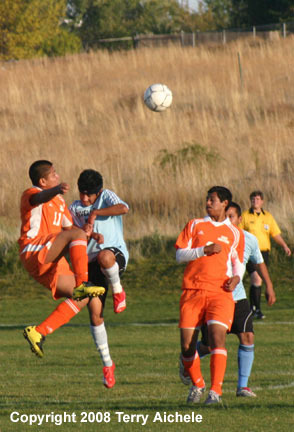 UMATILLA - Two of the top four teams in 3A Special District 5 soccer met at Umatilla on Thursday. The number two Riverside Pirates at 9-1 and the number four Umatilla Vikings at 5-3-1 played the match at the new soccer field near the Marina. Riverside scored the first goal at about the six minute mark of the first half on a drive by number 7. Umatilla scored its first goal off a free kick at the 15 minute mark of the first half. The defenses tightened and there were no more goals scored in rest of the first half. Four minutes into the second half Riverside scored from the right side on a crossing shot to take a 2-1 lead. Riverside scored again at about the 16 minute point to take a 3-1 lead. Riverside scored the final goal at abuot the 35th minute of the second half with a chip shot over the head of the Vikings goalie for the final score of 4-1. 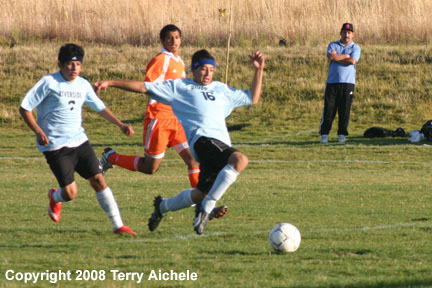 LEFT -A Riverside player drives into the Umatilla zone to take a shot on goal. 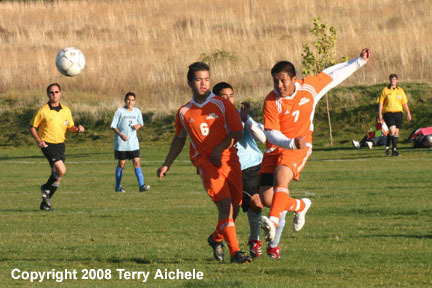 RIGHT - A Umatilla defender kicks the ball away from a Riverside forward. 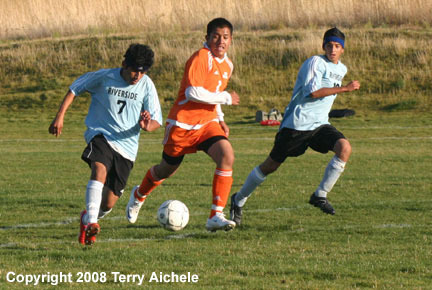 LEFT - Riverside number seven drives towards the Umatilla goal. RIGHT - There were a number of big headers during the match on Thursday. 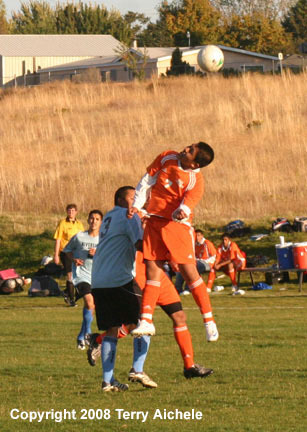 LEFT - A Riverside forward works the ball around a Umatilla defender. RIGHT - Both teams played all out on both ends of the pitch. 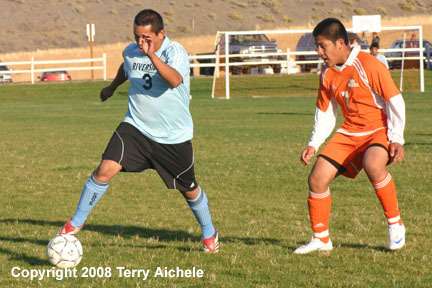 LEFT - A Riverside defender tries to break up a Umatilla pass. 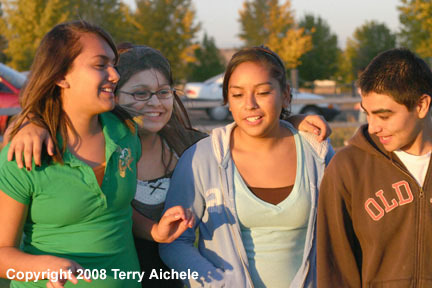 RIGHT - Viking fans Gaby Ramirez, Marina Longoria, Monica Bernae and Cesar Rodriguez joke around during the game between Riverside and Umatilla.